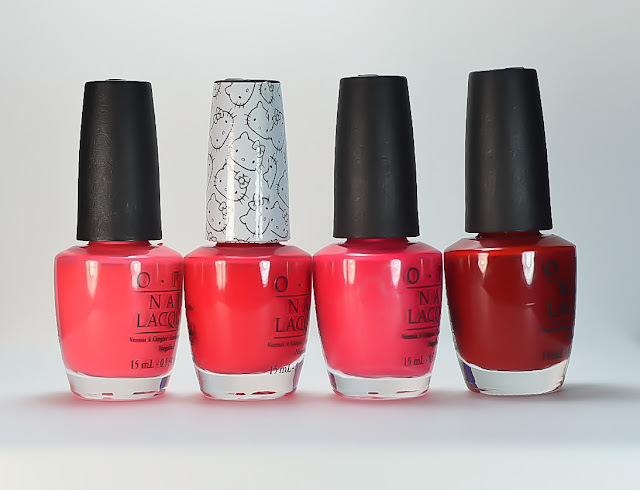 When I first heard about the OPI Hello Kitty collection, I think I did a happy dance. I kept my eyes out and my ears open for further updates and news about the cute kitty. I found a listing for the six piece collectors box on Ebay and bought it without a second thought. I'll be honest, I mostly bought it for the box since I'm an all things OPI collector. My swatches and thoughts!!! 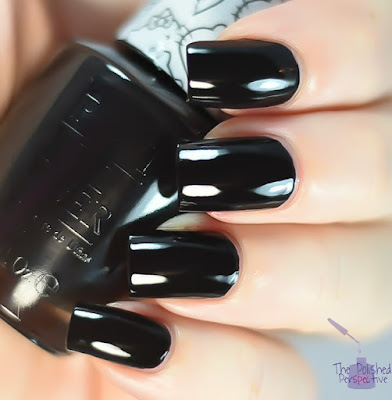 OPI Never Have Too Mani Friends: .....it's a black....it's an okay black. This is two coats and there's no way to get away with one coat. It's a two coater black. Starry Eyed for Dear Daniel: my favorite. Three coats, no top coat. OPI Look at My Bow! : this is a cute medium pink. I like this pink. Two coats, no top coat. Compared from left to right: Chic From Ears to Tail, Look at My Bow!, Kiss Me I'm Brazilian. 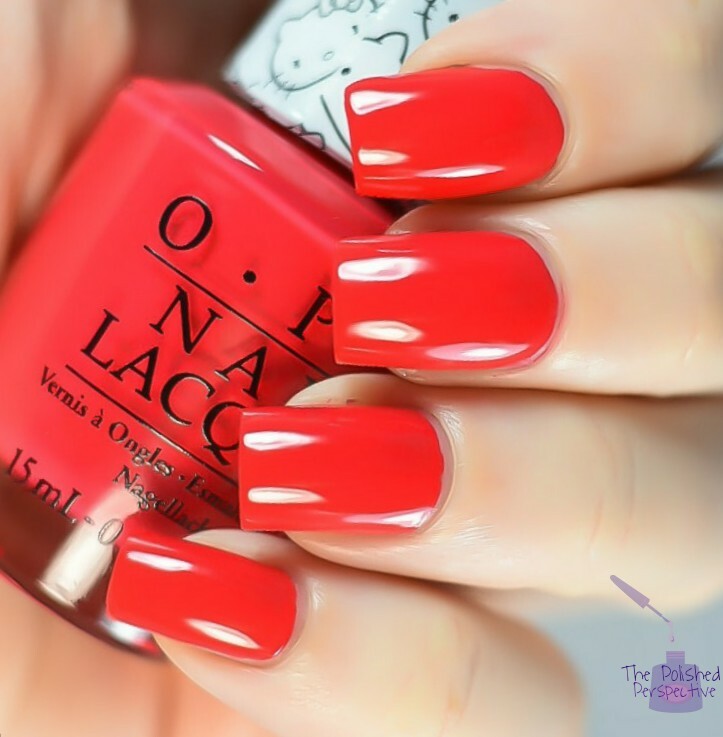 OPI 5 Apples Tall: this is a nice apple red with a great formula. Two coats, no top coat. Comparison from left to right: Live. Love. Carnival, 5 Applies Tall, A Definite Moust-Have, Red Hot Rio. OPI Kitty White: pearly white with a sparkle. I'm not a big fan of this type of polish. It's just too sheer for my liking. I stopped at three coats with this. It would look a lot better over a white base. Comparison from left to right: Pearl of Wisdom, Kitty White. Kitty White is heavier on the shimmer which makes it appear more grey. OPI Let's be Friends! : the first time I used this I went in with the wrong mindset. I needed to even it out with four coats. I'm not sure what I was thinking because this is an almost white pastel. So, for this swatch, I treated it like a pastel. I did two semi thick coats with a light touch and one thin coat with top coat. Comparison from left to right: Suzi Shops & Island Hops, Mod About You, Let's Be Friends!, I Love Applause, I Theodora You. *****This one was not included in the six piece collector's box. I bought a mini pack with a dotting tool. Why would I do that since I loathe minis? Because I have a problem. I wanted the Hello Kitty dotting tool and I bought minis just to get one. 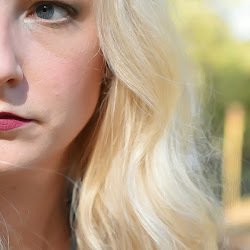 Soooooo, here's a swatch of the one shade that is different from the above swatches. OPI My Twin Mimmy: I had such an awful time applying this. The fact it was a mini might've factored in, but I doubt it. This is four frustrating coats and then I just slapped a top coat on hoping it would look okay. I don't like yellow anyway, so I definitely would not have bought a full size. This is a primary color yellow, not like OPI I Just Can't Copacabana. I don't have OPI Good Grief because it is also a primary color yellow and I don't buy those yellows, but I have a sneaking suspicion this is a lot like Good Grief. Overall, I'm just alright with these. I think I hyped this collection too much in my head. My favorites are Let's be Friends and Starry Eyed for Dear Daniel. There are a couple more I wish I had but I'll probably wait a bit for those. 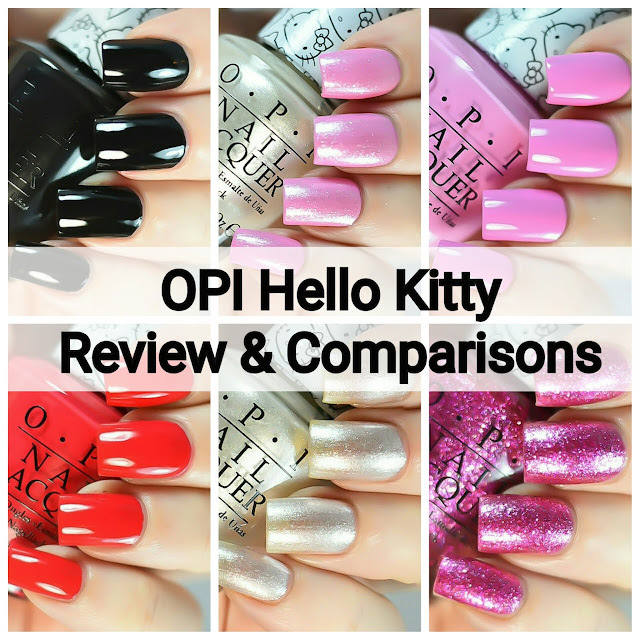 OPI Hello Kitty collection can be purchased at ULTA Beauty, Beauty Brands , and many other salons and retailers. What do you think of this collection? Have you bought any yet? Gorgeous swatches! I need Look at my Bow, 5 Apples Tall and Let's be Friends! I love these! Need those pinks!! Your swatches are amazing! As much as I love Hello Kitty, the colors are kinda meh for me. I kinda want to see the dotting tool, lol!